Take a look at this depiction of le premier mai by La Perriere. 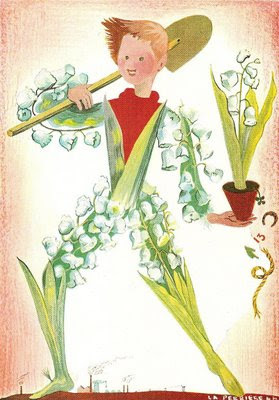 A youthful figure constructed from stems of lily-of-the-valley, also carrying a pot of muguets to offer to a special friend, as is the tradition, on the first of May. But look more closely at the ground beneath his feet. Do you see the factories in the distance billowing smoke? This May Day painting has the double message of sweet fragrant flowers and the toiling of the masses. For a bit of history of May Day in France, read here. Forecast in France for Friday, May 1: protests. And the beginning of a long weekend. The other French connection with May Day has nothing to do with lilies-of-the-valley or workers' unions. The international distress call, "Mayday, mayday" comes from the French m'aider. But you knew that already. Related post: Le premier mai. It was a long winter, I guess. Not harsh, but by April it was certainly time to exit hibernating mode. First order of business: membership in a sports club. Duly attired in my suburban athletic garb, I arrived at the gym for the complimentary session with a personal fitness trainer. Adriana was young, kind, and pretty, with the perfect All-American sculpted features one would expect of a Pilates pro. In between the instruction for the postural improvement exercises --“pinch the scapulae in a V” “balance on one foot on the foam block” “don’t forget to exhale!” – we chatted. When I told her I’d just moved from Paris, her eyes lit up. Or … were they actually catching the light as they rolled just a bit toward her raised eyebrows? “Three years,” I replied, pumping the 6-lb dumbbells from the waist, trying to remember to breathe. “You know,” she continued, shaking her head a bit, “when I was in college one of my sorority sisters spent a year studying in Paris. When she came back, she was so… different. She had all this French stuff decorating her room, she missed her life there. She got kind of depressed. And she gained weight and complained about it. About driving and American eating habits. She kept saying, ‘But in Paris we walked everywhere!’ She still wanted to do things the French way.” Adriana shrugged. Labels: francoFiles, where am I? Click here to start an amazing video. My son just skyped me. “Hey, Mom, have you seen Rendezvous in Paris?” with a link to this 10-minute video. Watch it if you have the time! On an August morning in 1976, French filmmaker Claude Lelouch mounted a gyro-stabilized camera to the bumper of a Ferrari 275 GTB and had a friend, a professional Formula 1 racer, drive at breakneck speed through the heart of Paris early in the morning . The film was limited for technical reasons to 10 minutes; the course was from Porte Dauphine , through the Louvre, to the Basilica of Sacre Coeur. And, on a nostalgic note, Paris has, euh…, changed a bit in 31 years. Look at all those 2 chevaux, for one thing. Update 2010: apparently this You Tube video has been removed from all sites. Not sure why. So worth watching. Perhaps some copyright issues? Somehow I always imagined that the Charles Atlas-type I-was-a-97-lb-weakling ads were an American phenomenon, limited to the front and back pages of the Archie & Veronica or Superman comic books of my youth. But here's an ad that I found from a 1954 issue of Realites magazine. The well-made woman ... and seductive. What's more, this was not merely a 50s trend: the exercise company had been in existence in Paris for about 25 years. And I thought working out in France was a new concept! Silly me. Mostly, though, I have pondered and pondered the semantics and linguistics of this ad, and of the phrases in general. In French, a man with a good body is well built, while a woman is well made. An intriguging item of beachwear design by Schiaparelli 60 years ago. Hmm. 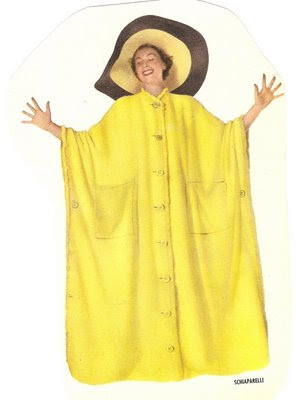 For you fashionistas reluctant to give up your Snuggies in the warmer months, I guess there's hope. Omidog. Sometimes I just love American life. I have just gotten word of the Annual French Poodle Parade in Santa Barbara, California, part of French week celebrating Bastille Day. This year the festivities for fluffy canines with a certain je ne sais quoi will be held on July 12. If we're lucky there might be an appearance by Mademoiselle Pseudo-Poodle, a Great Dane with crepe paper-puffs. So that gives me less than three months to a) buy or borrow a poodle and b) get a ticket to Santa Barbara, or c) start a copy-cat (copy-dog?) Poodle Parade here on the East Coast. I don't really remember what we did in French Club, except hang out and try to speak in French. 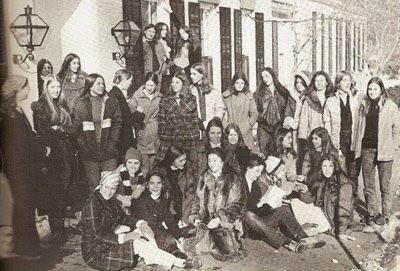 A few dozen high-school girls who loved French and France. Did we just love the language or was it the overall allure? Francophile that I was, I continued with French Club (co-ed!) in college, then moved on to membership in one Alliance Francaise or another as an adult. Recently I joined another French conversation group; we gather once a week for tea and chatter away en francais like schoolgirls. Er, I'm the second-youngest member, though. You do the math. If you want to be in a French Club, but there isn't one around, you can always start one yourself, of course. Why didn't I notice this in France? 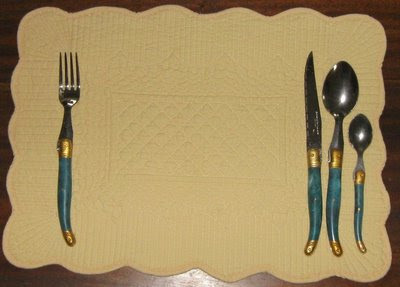 In my shipment of household belongings from Paris was my much-used, much-loved Laguiole cutlery. Perfect for casual entertaining. On Easter weekend I set five places at the breakfast table. Something was really wrong. The handles didn't all go in the same direction. My ingrained etiquette dictated that the knife blade face the plate, of course. But in doing so, the fork and spoon handles faced away from the knife. The visual disarray made me seasick. How could Laguiole POSSIBLY make a cutlery set that didn't match? (Sure, I bought it at a discount at Carrefour, but even so...) I fumed. And why hadn't I noticed this in Paris? In France the forks and spoons are placed on the table face down. See how they line up all pretty like sloops in a harbor? 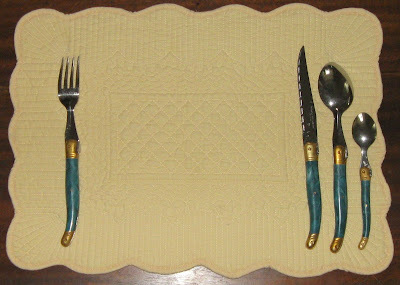 I guess I'll have to carry on the French method of table setting here in the U.S., because I simply can't abide the visual disharmony of wayward flatware. A tangle of legs delicately entwined. 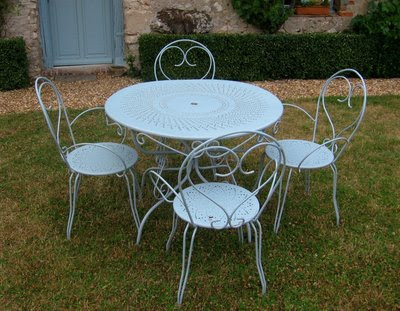 I just love French patio furniture. After purchasing a few packets of stamps, I found this adorable Happy Easter card. Whenever I acquire an old letter, I have a ‘satiable curiosity to learn more about Google its original owner. Surely there is a human-interest story in any document treasured for so many years, then disposed of. My mind conjures up all sorts of scenarios. To get a bit of context, I Google-mapped the address. It no longer exists. The building where this little girl Madeleine lived with her mother was apparently razed a while ago. What is there now is the gaping Place de Catalogne, a magnificent but over-sized and inhospitable circle of buildings near the gare Montparnasse. I wonder what ever became of Madeleine and her maman. Very soon, at Charles de Gaulle Airport, indoor smokers’ cabins will be installed in each wing of the Galerie Parisienne, and also in the corridors between Terminals 2D, 2F, and 2E. 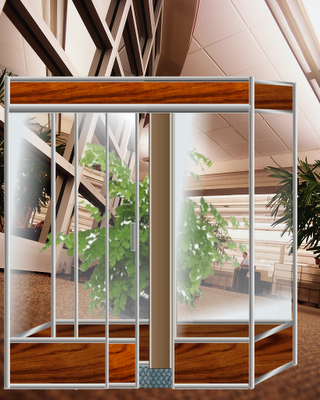 Overlooking the runways, each transparent Plexiglas cabin will accommodate up to 15 smokers at a time. Orly, on the other hand, will still restrict smoking to designated outdoor areas. I gleaned this intriguing tidbit of information from the Aeroports de Paris magazine. Here are a few interesting comments I’ve translated from the website of ExpairSystem, the manufacturer of the Smokers’ Cabins. Interesting, because in my mind it illustrates a difference between French and American views of smokers. In America, I think we tend to say “Just say NO to smoking!” Read on. "Why Install a Space for Smokers? Smokers’ cabins benefit everyone, both smokers and non-smokers. They take into consideration both the respect for all those around us and the laws protecting all from second-hand smoke. They protect non-smokers from secondhand smoke but also respect smokers in light of their tobacco dependence. According to statistics, smokers still comprise 30% of the French population. They have rights to equal treatment. For some, cigarettes are a drug. Being prevented from smoking can cause, in some cases, behavior that is aggressive and sometimes uncontrollable and stupid. Because for these people, it's not easy to find a substitute for a cigarette. Because it's not always easy to manage stress. So, what is the least harmful solution for their health: light up a cigarette or be prescribed antidepressants? Because the absence of special smoking places can produce impolite behavior or improper behavior, potential risks of accidents (smoking in bathrooms, smoking in dangerous but hidden locations, hiding butts in seat cushions etc., which cause fires). Installation of smokers' cabins assures a plan based on practical solutions of managing smoking risks. Because it can help your business -- you will not lose clients just because they can no longer smoke inside your establishment. In addition, non-smokers can visit your premises in total peace and enjoyment." I saw one of these cabins (website http://www.expairsystem.com/) in use in a private club in Paris on rue de Rivoli last winter. I have to say it was pretty cool. The smoker was on the inside, leaning on the mini-zinc having a glass of wine and a cigarette, and he could still see and converse with his non-smoking friends outside the Plexiglas, through the ventilation holes. Not a whiff of smoke outside the cabin. And not that horrible stale tobacco odor lingering on the clothing of the smoker who's just come in from the cold, because in the cabin the smoke gets pulled away immediately. I wonder. Only 20% or so of Americans smoke cigarettes, last I heard. Would we be this pragmatic? Should we vent about smokers or ventilate them? Nyuk-nyuk. We know the snappy answer. Ah, but why does the Statue of Liberty travel across Paris? This is for real. Joggers in the Jardin du Luxembourg who are accustomed to seeing the diminutive version of Bartholdi’s Lady Liberty (Liberte eclairant le monde) need not be alarmed at her absence. Today she embarked on a trip across Paris and has ended up in the Jardin d’Acclimatation to participate in a month-long exhibit about Americans in Paris. She will be accompanied by other icons of American culture, including some classic cars, and baseball demonstrations. Will there be hot dogs and apple pie, too? There will be weekend parades featuring American-style cheerleaders and “super dunks". (?). Also jazz and gospel music, movies, and more. The Jardin d’Acclimatation (and even my French friends stumble when saying it) is a children’s park in the Bois de Boulogne in the 16e arrondissemment. Check out the Jardin’s website here, though be warned that when I checked the English version wouldn’t pop up. Paris is my mecca for inspired home decor on the cheap. I wasn't disappointed this time. In the dining room of the Virginia house I'm renting, there is a black colonial wrought-iron chandelier. In and of itself, not a bad lighting fixture. But to my eyes it was too austere for the room, and the pseudo-Provencal lampshades didn't go with the rest of the Polly look or color scheme. And besides, my Parisian sensibilities called for something a bit softer, more feminine. I hung some pearl Christmas strands to soften it, but it still needed more. I found the remedy in Paris -- where else? 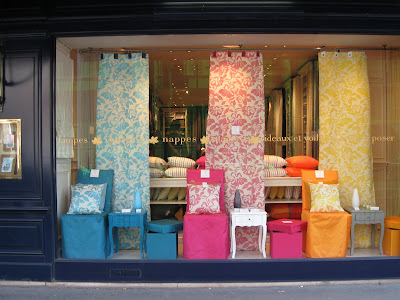 While out shopping last week, a few blocks down from BHV on rue de Rivoli, I stumbled upon one of those Paris-Affaires shops, kind of like Dollar Stores in the US. They had bunches and bunches of the prettiest fake flowers I've seen in a long time. I scooped up 3 bottes, 3€50 each. Saturday at the Marche aux Puces in Vanves, I was actually looking for some Luneville plates. No luck. But I did spot some wacky crystal bobeches in a variety of pastel colors. A few were missing a hanging crystal or two, and the owner was clearly eager to get rid of them to this ignorant American lady. I smiled all the way home, having purchased 6 bobeches for 15€. I haven't even finished unpacking my suitcase, but I couldn't suppress my urge to re-look my chandelier. Should I entwine the pearls? The photos don’t really do it justice. Paris is full of arches. Not just the Arc de Triomphe. Here are three I happened upon. 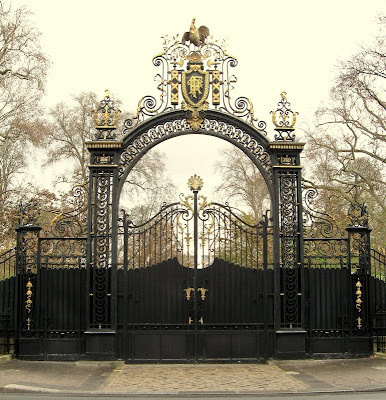 The lacy iron gate at the rear entrance to the Elysee Palace on avenue Gabriel. Not your average backyard fence! 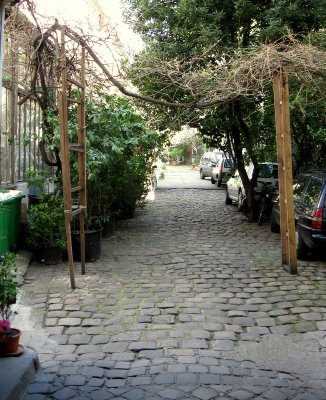 A hidden courtyard near the Bastille. Oh, wow: I want to live here. 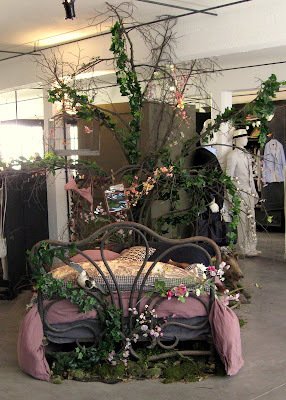 This sumptuous Sleeping-Beauty bed in Merci, a cool, ultra-hip new store on boulevard Beaumarchais. Usually I find it's pretty predictable to figure out what the 'it' color will be in Paris by spotting a glimpse of a certain hue a few times on the street. Well, I was stumped this time -- the only exceptional color I noticed parading along on the Parisian sidewalks was a fair amount of fuchsia-colored scarves. Surely that's not the new trend, I thought. Looking for a fashion weather vane, I poked around to see what was being promoted in the store windows. Get ready, folks. Think no further than your Easter-egg dyeing kit, or your bag of Skittles, because this season's hot colors are apparently all variations on sweet candy. Bubble-gum pink, apple green and an electric blue ...best left undescribed. For those who can't stomach the brightest of brights, a creamier, paler pastel version is also acceptable. OK fashion gods, have at it: Paris has gone 60's preppy. Neo-preppy? Neon-preppy? Who knows? 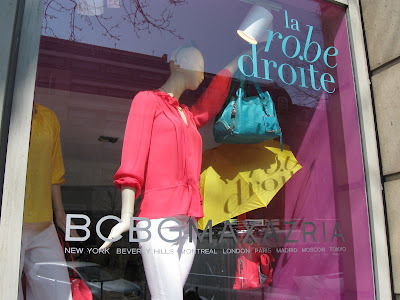 The BCBG window says it all. But also home decor, this at Madura. Get me my PAAS egg-dyeing kit! Vinegar and those little metal hoops for holding the eggs. And you men can stop hiding in your navy, forest green and cognac-colored duds. Oh, no, you are not spared. 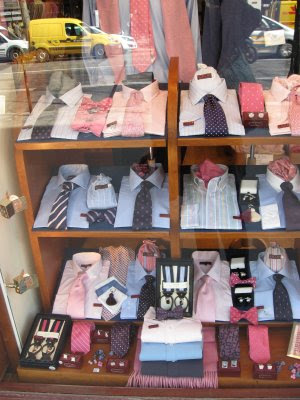 PINK is all over men's apparel. Uh, right down to the unmentionables. No more tighty-whiteys -- now the nec plus ultra is -- what? -- slinky-pinkies? 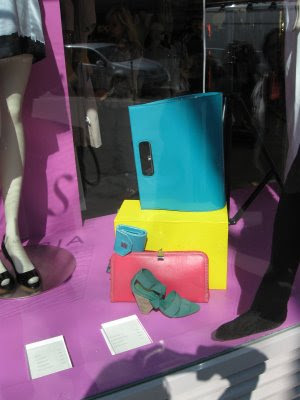 Last spring I spotted a few street glimpses of this color trend, and photographed samples at Calypso, a chic boutique in the 16e; but, then, as far as I could see it never really panned out. 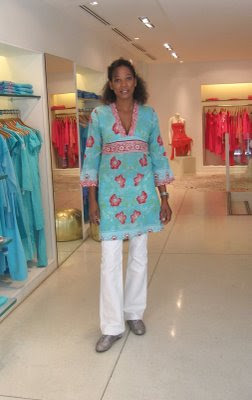 Yes, one year ago, no kidding: I was all ready to contact Lilly Pulitzer and convince the owner to open a boutique in Paris (with me as marketing consultant?) to capture the magic of the fashion moment. But I figured it was just a flash in the pan.